Community Blog by nekobun // The legacy of the (unlikely) wizard. January, 2001. I remember it well. I was browsing the shelves at Funcoland, getting my hopes up with a birthday soon on the way, when some ethereal music caught my ear. Wandering over to a demo station bearing a Sega Dreamcast, a system I'd mostly overlooked to this point, I soon became entranced by visions of another world, rendered in ways I'd never seen a console pull off before. Having grown up with the Nintendo family of consoles, I'd only briefly tasted what the Phantasy Star franchise had to offer, mostly through the heinous grind that the first two games in the series could be. This version, however, which also boasted online multiplayer, had its hooks in me quickly, from the intro alone. Alas, I never got around to exploring Ragol in version 1 or 2 of the original Phantasy Star Online, as it wasn't until after the Dreamcast's discontinuation that I was able to get my hands on one, and it's not like I would have had time for anything outside of the story mode, anyway. It was with great joy that I learned that the game was getting a bit of prettying up for a version coming to the Nintendo Gamecube, and a pre-order was pretty much inevitable. When I first started the game, it was simple enough. My main, sharing the name I use pretty much everywhere online, was a HUmar, and I spent weeks slashing my way through the forests, caves, and ruins that had claimed so many Hunters before me. After about forty levels or so, it felt worthwhile to start exploring other race/class combinations, which were easy to roughly model after beloved characters from other games, thanks to PSO Episode I & II's rather robust character creation system. I worked my way through the other HU types, then the RA-designated Rangers, and finally, was left with Forces, or FOs for short. To be honest, I'd not played much in the way of spellcasters in any game, digital or analogue, up to that point. Friends counted on me, often with some sighing or groaning, to fill the role of half-elf ranger in Dungeons & Dragons sessions. 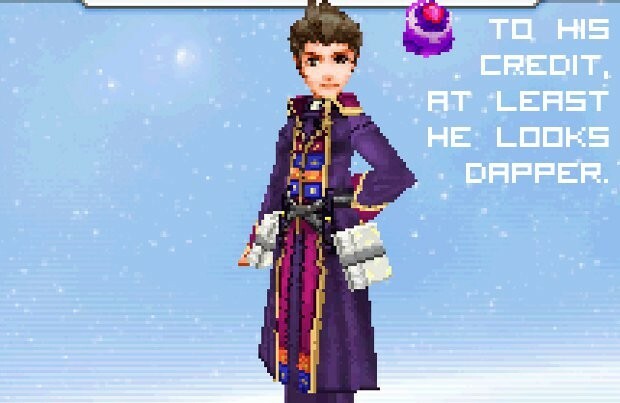 Constantly afraid of running out of mana, magic points, or whatever energy powered my wizardry at critical points, I often kept casting to a minimum in the Final Fantasy games and other RPG titles growing up. However, I'd been enraptured by the way magickal powers were handled in a modern-day setting in White Wolf Games' Mage: The Awakening system, so I decided to dive into the realm of squishy fireball-lobbers for once. Modeling and naming my dress-wearing dude after my most successful Mage character from a Philadelphia-set, World Of Darkness MUX where I'd once wasted far too much time, Kerron the FOmar took his first steps onto the deck of the Pioneer 2, and soon, on Ragol's surface as well. Doing so was one of the rewarding leaps of faith, at least in gaming, I'd ever take. The day Phantasy Star Online: Ep. I & II plus was released, adding new quest and story content to the already enormous game in the days before downloadable content was a thing, I scrambled off to the common room of the dorm house several of my friends called home, settling down while hanging out with them to pound new creatures on new quests with my already impressively-leveled Foie, Barta, and Zonde. My Gamecube eventually saw an evolution in the form of a small, portable screen that folded over the top and came with a car adapter, so I could play on the go and even if the handiest TV was occupied. After a great deal of searching and scraping together of funds, I imported a controller with a keyboard built into the middle, to make conversing on the fly that much easier and less reliant on preset messages. It wasn't until the Gamecube servers were on their way toward obsolescence, infested with kids who thought image macros of Hitler and swastikas were a cute idea and abandoned by the masses who were moving on to the PC-only Phantasy Star Online: Blue Burst (which my computer couldn't, unfortunately, handle) that I finally gave up, and waited for the next, rumor-surrounded, PSO-flavored thing to come. In the meantime, I tried to find some solace in Phantasy Star Online: Episode III C.A.R.D., but its peculiar hybrid of collectable card game and turn-based strategy had failed to interest many, disappointed a great deal of those who'd invested in what they'd hoped would be more PSO delight, and was fairly underrepresented in its player base. 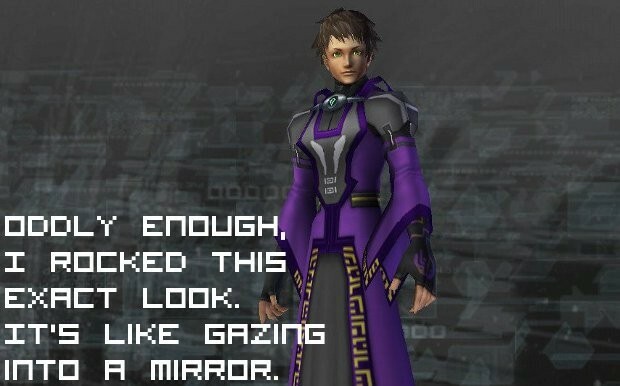 Despite it being weird to a fault, I was kind of enamored by PSO: Ep. III's odd charm, and stuck with it at least long enough to finish the story and play a handful of online matches. One thing that helped that along was a FOmar by the name of Break, who led the Arkz faction in the game's plot. Aside from my affinity for his class, his personality was one I found easy to identify with as well, which was enough to keep me engaged and see the game through to the end. Once details finallly began emerging regarding the multiplatform successor to PSO, Phantasy Star Universe, it felt like falling in love all over again. 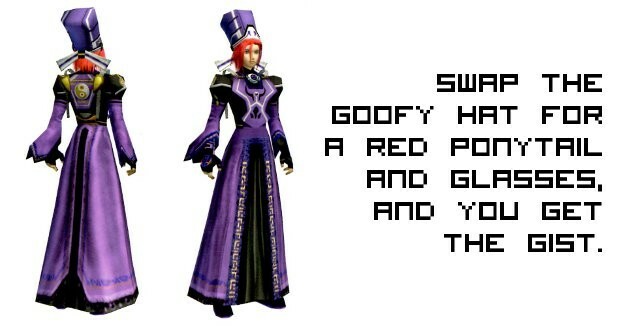 While the art direction had taken a distinct turn from the prior game, this was made understandable by the explanation that PSU was not a direct sequel to PSO, merely a spiritual one, and the spoonful of sugar was heaped a bit higher when it was revealed character development was to be a great deal freer. Switch your class when you feel like it? No way! Customizable outfits split up between tops, bottoms, footwear, and accessories, with new clothes available in stores later on in-game? Hoo, man. More and bigger areas, new enemies, and a whole new character race to try out? Sign me up! In the end, PSU didn't entirely live up to its pedigree, seeming like a muddled mess of too many ideas, all tied together more loosely than people paying full price for the game and for a monthly subscription on top of that would have liked. 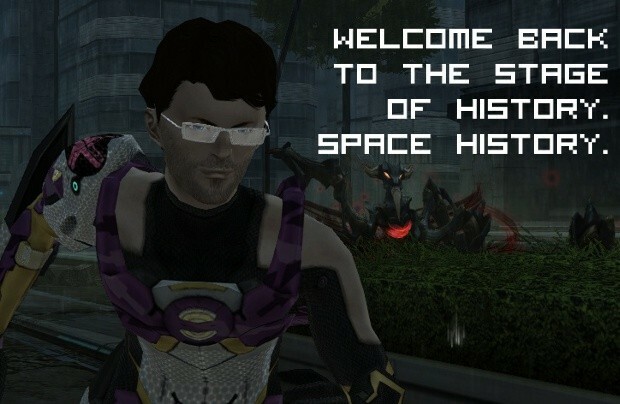 It had its moments, and wasn't altogether bad, but it was no Phantasy Star Online. I'd almost completely abandoned the game when, in conjunction with one of their festival events, Sega decided to release character outfits modeled after the old PSO classwear. If it was their plan to reinvigorate interest in players, it worked; myself and several other veterans from the Dreamcast and Gamecube days returned to the Phantasy Star Universe servers with enthusiasm. The timing couldn't have been more perfect, personally, as I'd recently leveled to the point I could start working my main character through the Masterforce character class. Decked out in robes of black and purple, as Kerron had before him, Masterforce Picklebutt (no, really) would go on to rain destruction across all the planets of the Algol system, and whatever meteors or stations happened to lie in between. Such renewed interest could only last so long, however. After sporadic intervals of intense play and equally intense disinterest, sheer burnout on anything Phantasy Star kept me from investigating Phantasy Star Portable on the PSP, despite reports Sonic Team had fixed many of the problems present that plagued the Universe upon which it was based. My last deed in PSU was to kill Dark Falz 2, the final, bonus boss unlocked fairly late in the life of the Ambition Of The Illuminus expansion, in order to round out a perfect gamerscore for the game. After that, I may have logged in once or twice, but I was done, and no amount of promotional statues or decor for my on-station apartment could bring me back. The Nintendo DS take on the Phantasy Star Online model, Phantasy Star Zero, was interesting as a bit of a distraction after that, with its gameplay, visual style, and class system all hearkening back to the glory days of the game to which its initials, PS0, nodded. Despite obviously being an attempt to buy into the nostalgia of those who missed Phantasy Star Online, the game had its own charm, being a great deal more cartoony and lighthearted than any Phantasy Star that had come before, and with character and environmental designs that, while inspired, still held their own, unique charm. Despite how much fun PS0 was to play, and how well it tickled the fanboy in me, the DS' cumbersome, clumsy online experience and the hassle that is the Friend Code system were enough to turn me off after only a few online runs. It was, honestly, a bit of a miracle that I even finished the offline story mode, though at least I can say I completed 100% of the offered quests. 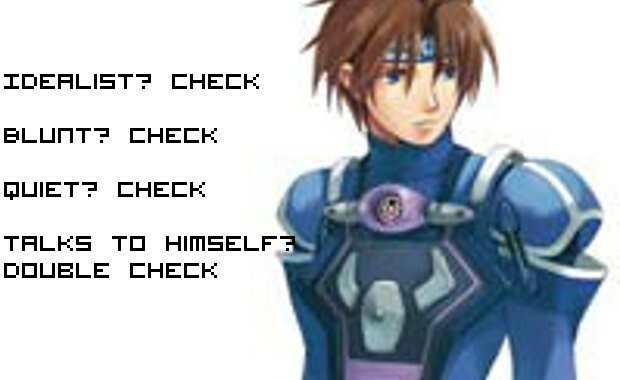 Phantasy Star as an online entity, from there, seemed destined to fade into obscurity. Phantasy Star Universe was a dwinding memory, with servers turning into ghost towns, and Phantasy Star Portable 2 players keeping the franchise thrumming along, albeit weakly. When it was announced the Xbox 360 servers for Universe were going down this past September, it came as a legitimate shock that they'd even lasted this long. It felt as if the days spent as various Forces were to be but fond recollections, moments to look back upon while perusing my Japanese PSO: Ep I & II artbook and perhaps even getting a bit misty-eyed. That is, until word came of a beta for a title I never thought would have happened. Phantasy Star Online 2. A long-overdue direct sequel was coming, and, we soon learned, it was coming to territories outside of Japan eventually as well. The twin trinities of Human, Newman, Cast, and Hunter, Ranger, Force were coming back. The game many of us had been waiting for as far back as Blue Burst's closure in 2010, or even since Phantasy Star Universe's release as something other than Phantasy Star Online in 2006, was, nay, is on its way. And rest assured, I plan to be there. Taking its visual and thematic groundwork from the original PSO, and simultaneously upgrading it to the capabilities of modern hardware and hybridizing things with elements from Phantasy Star Universe, PSO2 promises to be the experience so many of us PSO old-schoolers have been yearning for, in some cases, for around half a decade. While the look isn't quite the same for my beloved FOmar role, it's close enough that I know firing up some Techs and loading up on Monofluids will be like getting back on a bicycle after so many years. A little clumsy at first, to be certain, but after that, even whatever form Dark Falz has decided to take this time around had best beware. Sure, I could jump on the Japanese servers already, but my grasp of their language is tenuous at best, and I want to be able to savor every glorious minute of the game in a localized form I can fully understand. I can't wait. Whatever date in the rather nebulous "early 2013" to which Sega decides to pin Phantasy Star Online 2's North American release cannot come soon enough.